The University of Nebraska College of Law will host a commemoration of the seventieth anniversary of the Universal Declaration of Human Rights on Monday, November 26 from noon to 1:30 pm in the Hamann Auditorium. 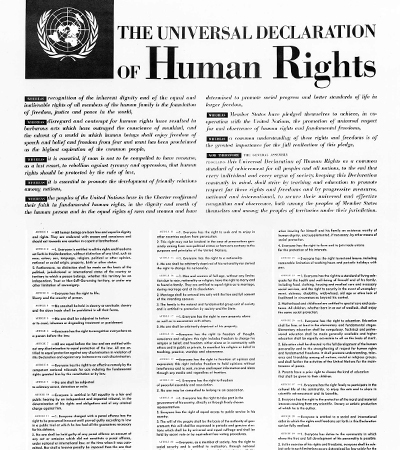 The Universal Declaration, which proclaims human rights to which everyone is entitled, was adopted by the United Nations General Assembly on December 10, 1948, seventy years ago. The theme of the commemoration will be “The Universal Declaration of Human Rights at Seventy: Reflections on Its Relevance for Nebraskans.” The commemoration is co-sponsored by the College of Law and the University of Nebraska’s Forsythe Family Program on Human Rights and Humanitarian Affairs. The keynote speaker at the commemoration will be Dr. Micheline Ishay, Professor at the Josef Korbel School of International Studies at the University of Denver and a renowned expert on the history of human rights. She is the author of a number of acclaimed books on human rights, including The History of Human Rights, from Ancient Times to the Globalization Era; The Human Rights Reader: Major Political Essays, Speeches and Documents from Ancient Times to the Present; and The Levant Express: The Arab Uprising and the Future of Human Rights (forthcoming). Dr. Ishay will be joined by two other speakers. The first will be Professor Anna Shavers, Associate Dean of Diversity and Inclusion and Cline Williams Professor of Citizenship Law at the University of Nebraska College of Law. Professor Shavers is an internationally recognized expert on human trafficking and women’s rights. The second will be Dr. David P. Forsythe, Emeritus University Professor and Charles J. Mach Distinguished Professor of Political Science at the University of Nebraska. Dr. Forsythe is an eminent scholar of international human rights and is the founding benefactor of the Forsythe Family Program. Professor Brian Lepard of the College of Law will introduce the speakers. Dr. Courtney Hillebrecht, Director of the Forsythe Family Program and Samuel Clark Waugh Professor of International Relations in the Department of Political Science, will moderate the discussion among the panelists.